ATTiny85 - Welcome to Las Vegas! > ATTiny85 - Welcome to Las Vegas! 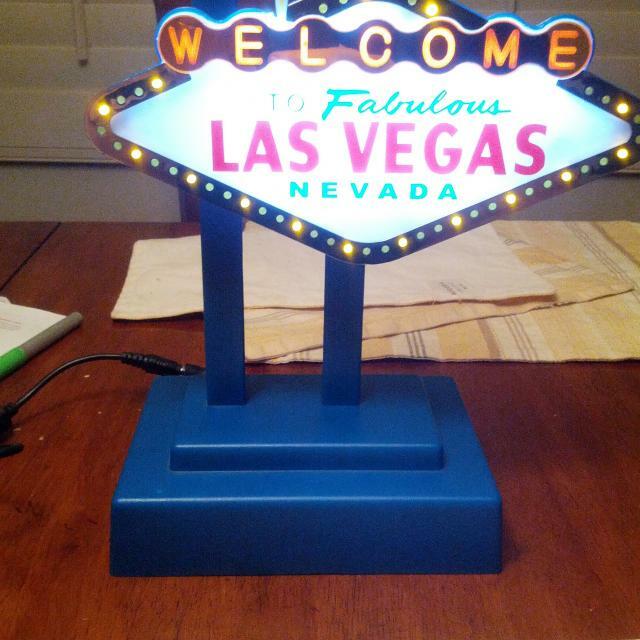 A souvenir "Welcome to Las Vegas" sign had broken on me and sat broken for over a year in my office. 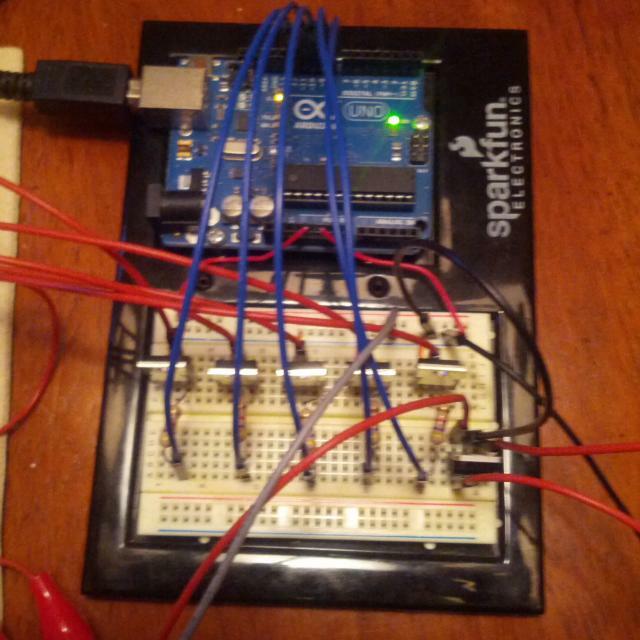 Finally decided to fix it with the Arduino as both a fun project and a learning exercise for my 12-year old son. Currently, the program is a simple pattern, similar to the actual sign in Vegas. Code is attached for reference. Re: ATTiny85 - Welcome to Las Vegas! Have (had) you considered using a TLC5940? The 18V is a bit above the maximum but I suspect that would not be a problem. Might use something like that in the future. Honestly wasn't even planning on using the ULN2803, was just going to wire up the transistors directly. But the internal resistors and small footprint of the ULN2803 makes wiring so much neater. The TLC5940 does need a total of four connections to the processor which may make it a little difficult to use with a t85. I know the TLC5940 works well with a t84. If you don't need PWM (or are willing to mimic it using software), the TLC5916 is a nice inexpensive alternative to the TLC5940 that needs the usual three connections to the processor. Apart from the ease of use of TH vs SMD, would you prefer to use the TLC5940 over the PCA9685, which is I2C accessible and free-running? For what I do, I prefer the much higher current / voltage / power limits of the TLC chips. I use CLKO (CKOUT) for the TLC5940 clock (the fourth connection I mentioned above) which ties up one more processor pin. I suspect the sustainable data rate for serial (TLC) is higher than for bus (PCA9685). I've been getting about a 400Hz refresh rate with a single TLC5916. I suspect adding a second TLC5916 would have a negligible affect. I don't think I could do the same with a PCA9685. I put an order in recently for a bunch of 5940s a week ago, then read about the ADAfruit break out for the PCA. I am wanting to put a few models together, with between 2 and 6 servos. For the 2, 3 & 4 servo models, I was actually thinking an attiny85 hooked up to the 328P main mcu via I2C could be used as a PWM source. I'll have both ICs so experimenting is on the horizon. Do the TLCs have advantages over the use of another mcu? I realise it can be a bit of overkill, but in my naive frame of mind it seems it could provide some flexibility being able to program smarts into the PWM generator, and even do 2 way communication with it. Oh hmm. Are you driving the devices directly from the TLC? The attiny would need FETs or something to drive the servos. I am wanting to put a few models together, with between 2 and 6 servos. For the 2, 3 & 4 servo models, I was actually thinking an attiny85 hooked up to the 328P main mcu via I2C could be used as a PWM source. I'll have both ICs so experimenting is on the horizon. Do the TLCs have advantages over the use of another mcu? For controlling servos? I have no idea. Oh hmm. Are you driving the devices directly from the TLC? Yes. Which is one reason I like them (fewer total parts). And why I suggested them to @int2str. The attiny would need FETs or something to drive the servos. No. A servo is "driven" by a simple low current (relatively) low voltage signal. 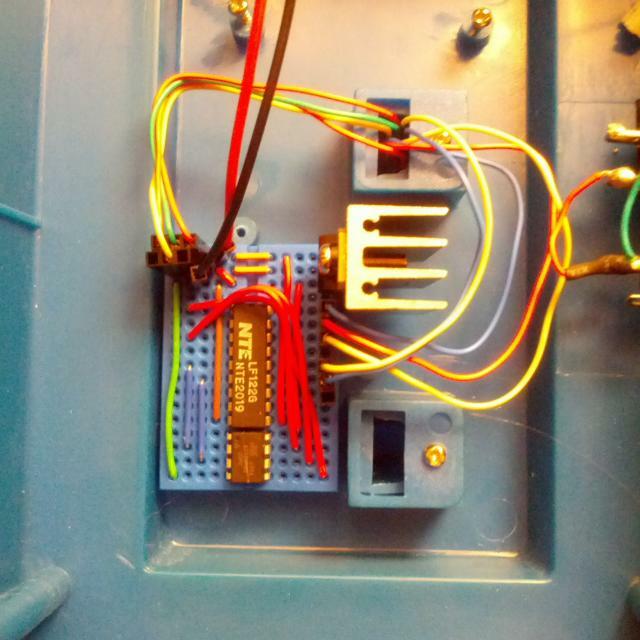 A FET is not necessary when controlling a servo with an AVR processor. Because the TLC5940 is a constant current sink, I believe you need a transistor (or resistor) for each line when using the TLC5940 with servos. On their website, Texas Instruments has an application note describing how to use the TLC5940 with servos. Thanks. I was confusing servos and steppers - I have servos on the brain and the stepper driver I was just looking at in the same mental space. I'll check out the TI application note.